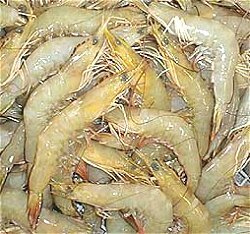 Size: Eastern king prawns to 30cm body length (commonly 14 - 21cm) Average commercial weight is about 50g. Season: All year, the main catches are March to November. 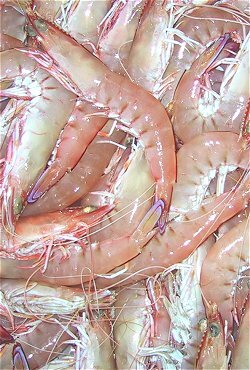 As we get more into the season the higher percentage of larger size prawns increase, the start of the season see a higher percentage of the smaller sizes - 10/15 & 16/20. Sizes Available: U/6, U/8, U/10, 10/12, 10/15, 16/20 pieces to lb. Packaging: Packed and frozen at sea. HOSO (Head On Shell On) 5kg net weight carton. Brand: The brand name is normally the name of the fishing boat, a standard carton is used and the name of the boat on the carton with catch dates etc. Quantities (Approx) available over 12 months: 200,000 kg. 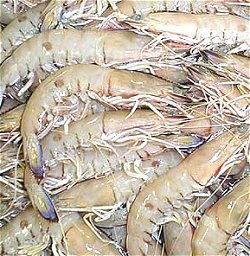 Size: Western king prawns to 20cm (commonly 10-16cm) Average commercial weight is about 50g. Sizes Available: U6 (Small % available), U/8 (Small % available), U/10, 10/12, 10/15, 16/20 pieces to lb. Packaging: HOSO (Head On Shell On) Packed and frozen at sea. 5 kg net weight cartons. 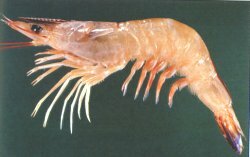 Also known as Redspot prawn. Season: All year, the main catches are April to November. Packaging: Packed and frozen at sea. HOSO (Head on Shell on) 5 kg net weight cartons and Catch weight cartons, approx. 14kg. Quantities (Approx) available over 12 months: 50,000 kg. Sizes Available: 10/15, 16/20, 21/30 pieces to lb. Packaging: Packed and frozen at sea. HOSO (Head On Shell On) 3 x 3 kg net weight cartons and Catch weight cartons, approx. 14 kg. Quantities (Approx) available over 12 months: 100,000 kg. 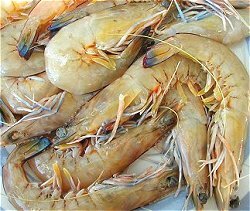 Also known as Indian banana prawn, redleg banana prawn, white banana prawn, white prawn. Season: All year, the main catches are April to June.